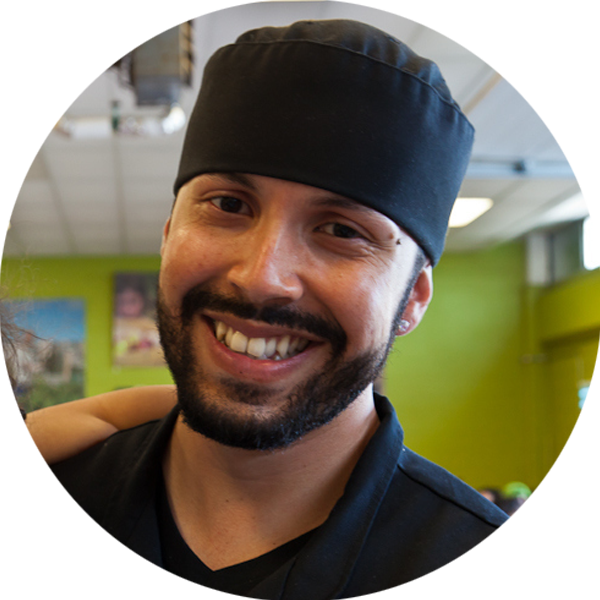 Jesus Gomez is the visionary and passionate Chef and Coordinator behind FoodShare’s Good Food Cafe program, which models universal and healthy school cafeterias, in six school communities, serving attractive, delicious and nutritious food to over 400 students each day. Working in collaboration with his team Jesus designs menus that are simple to prepare and highlight seasonal and local food as much as possible with the ultimate goal to create a generation of healthy and knowledgeable eaters who understand and appreciate healthy food. As a leader in modelling healthy school food, Jesus approaches his work with great care, mentoring new generations of chefs that find their way to his kitchen through student placements, workplace partnerships, and volunteer postings. Anyone who has the pleasure to collaborate with Jesus comes away with a deeper appreciation for wholesome, healthy food and a belief that that change we need in school food is not only achievable, but delicious. Jesus has become a compelling and experienced leader in the movement to transform school food, with weekly requests for training and support from school communities looking to replicate his model across Canada and significant praise from local and national media, policy advisers and partners. He is a passionate, creative and skilled chef, dedicated father and youth mentor, and captivating advocate to advance food literacy and healthy school food policies to enhance the health and well being of children and youth. Jesus is responsible for the day­to­day coordination of the Good Food Café including menu planning, food preparation, staff training, supervision, program planning, resource development, etc. In 2006 Jesus began his work with FoodShare as a youth intern in our Focus on Food employment program. Upon completing his internship he joined FoodShare’s staff as a youth mentor, and eventually became one of the program’s coordinators, mentoring over 40 interns in culinary and life skill development. Jesus has also been instrumental in the success of many of FoodShare’s large scale catering events, showcasing his creative flare at signature events like our annual Recipe for Change fundraiser, Taste of the Terminal and hundreds of community events, drop-in programs, etc.